No, this is not yet peer reviewed. This is breaking news, and it's not had time to be assessed by experts in the fields, or even people who are tangentially acquainted. However, unlike P vs NP, this problem does not have a long history of a "proof" per day by cranks, and a paper every year or so by established mathematicians. It's unusual to see a paper claiming anything substantial about this problem. It's in Russian. If you can read Russian, and are acquainted with the math involved, then feedback would be most welcome. In the meantime this might be the solution, it might be an ultimately flawed but useful advance, or it might be nonsense. Having said that, if it has been solved by someone who is primarily in a teaching (as opposed to research) post, then it's plausible that they would spend some time (12 pages? Hmm) setting up the problem and notation. His paper may contain errors, but he's not a crank. There is absolutely nothing wrong with spending considerable effort on correctly stating the problem and notation. A long time ago, I started working on an approach that never panned out, attempting to prove that such solutions could not exist. I will briefly mention it here in case anyone would like to comment or continue the strategy. In  I learned that it is known that certain differential equations associated with embedding manifolds in R^n possess no smooth solutions. And in  I asked if it was possible that the Navier-Stokes equations were of this nature, since if this was the case it would create a clear path towards a negative solution. There was no definitive answer given, but the community (of mathSE) did seem to agree that it would turn it this is not the case. I'll believe it when I see the prize get awarded. Until then, I'll file this beside that guy who writes a 'solution' to P=NP every month on arxiv.org. I wish people who submit links to HN would think before doing so. Would you rather see more of 'why I dont eat lunch at my desk' stories? 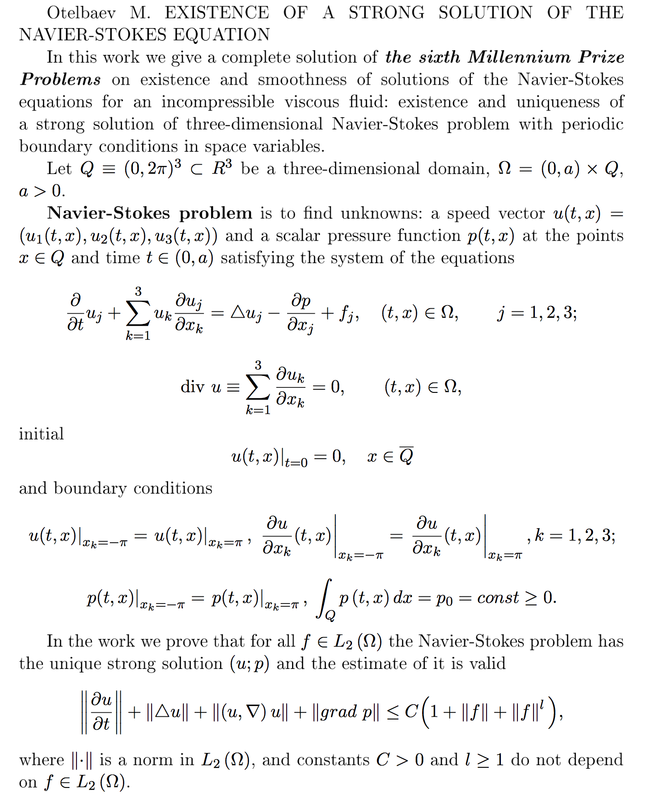 If this article had a link to the actual document "Existence of the strong solution of Navier-Stokes equations", then we could have an actual discussion about the mathematics. good to know. I almost assumed that everyone would have believed it without seeing the prize get awarded. "Navier–Stokes Equation: This is the equation which governs the flow of fluids such as water and air. However, there is no proof for the most basic questions one can ask: do solutions exist, and are they unique? Why ask for a proof? Because a proof gives not only certitude, but also understanding." I remember listening De Sautoy podcast on BBC, that Euler was not able to solve/find the equation that governs fountains and that it was unsolved. Is this relevant to the topic? ps. Never mind, I guess this answers the question. CMI: the original Stack Exchange. At this rate they'll all be solved by mid-century. Weren't these supposed to last us like a millenium or something? "Weren't these supposed to last us like a millenium or something?" Why would you think that? Ah okay, guess I misunderstood. I wonder, if true, how it will change CFD. That is, will it change at all. Well, if it is true, then it could indeed change CFD. Imagine that the computational stencil can solve itself using a closed-form equation. A strong solution implies that you don't have to form matrices to couple the linearised equations. Well, just to put it in some context. The paper was published in the Eurasian Mathematical Journal, of which the author is the editor-in-chief. According to this article, he claims to have found a strong solution. My prediction was/is that the types of solutions asked for by the millennium problem were not going to exist, so my first instinct is to not believe this, but clearly that is not a good reason. So, at the risk of being wrong, I will make the following not so bold prediction: there is a critical mistake somewhere in the paper and the approach will ultimately not pan out. The prize is awarded either way. You have to prove that a solution exists or doesn't exist. http://www.claymath.org/millennium-problems/rules-millennium... In the case of the P versus NP problem and the Navier-Stokes problem, the SAB will consider the award of the Millennium Prize for deciding the question in either direction. That's true, but if the paper turns out to have an essential flaw, it does not prove that no solution exists, it just does not prove that a solution exists, just like this post. I think it would be funny if someone really went just that far, though: give an existence proof for a solution that is not constructive. I'm curious why you think that would be funny, since in my opinion, that is the most likely outcome should such a solution exist at all. Funny probably is not the right word, but I like it when mathematical breakthroughs reinforce the public's perception of mathematicians as living in their minds, not in the world. Because of that, I would find it more 'enjoyable' to see a proof that a polynomial time algorithm for TSP exists, than to see a proof by example, or to see a proof that go is a win for white or chess for black than to see a program that plays the game perfectly (and of course, within the space of constructive proofs, there are gradations. Exhaustive search would be extremely dull; a theory that generalizes to other problem spaces would be more interesting. Moving to another problem the various O(<n^3) matrix multiplication algorithms are 'funny' because, AFAIK, none of them has practical use. Precisely. In the case of the NP-hard example I presented below, the researcher (who's name eludes me) attempted to prove that a solution did not exist. If crypto relies on some algorithms that are O(n^100000000000) where n is key length, I'm not very worried. It wouldn't (probably) render the algorithms who rest upon the assumption that P!=NP useless. You still have to find a fast algorithm for the problem. Just because it is in P doesn't mean there exists a (practical) fast algorithm to break the crypto. 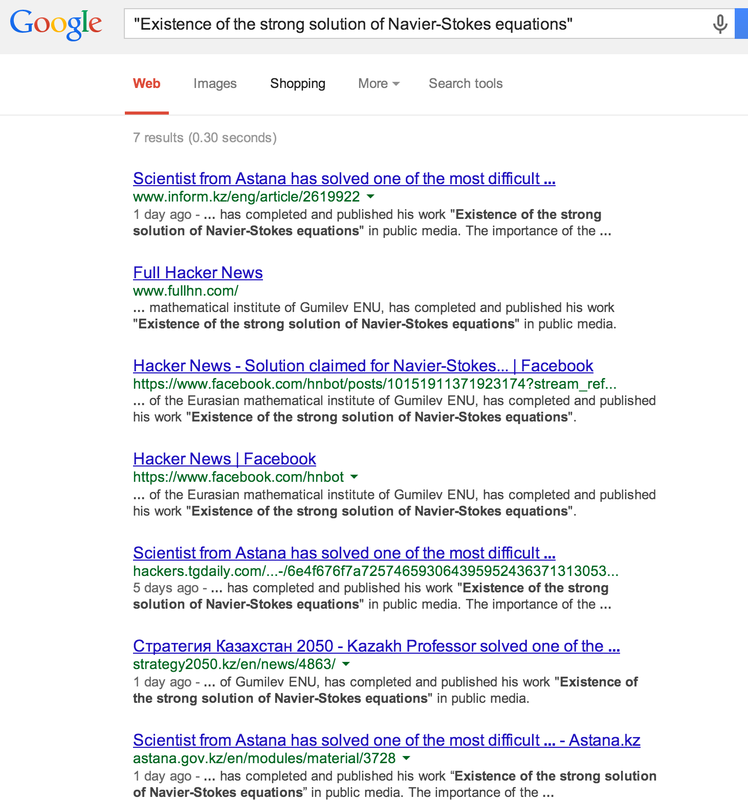 There was a researcher from HP that did the same for "NP Hard" some years ago, that finished in the same place. He took a new angle, but ultimately, the proof didn't hold up. While it was disappointing in the end, the attempts are laudable. Here's hoping he got it, and if he didn't, that he at least manages to contribute a novel approach. Kinda strange, I cannot find the manuscript and not even his homepage (http://otelbaev.com) is updated. Wouldn't one expect this to be reported either after a successful peer review or after publication of a preprint? Basing opinion on citation index is like saying if this person is not widely cited he is likely to be wrong. From what I know, it is common for researchers in US and EU to cite each other. However work from say China or other Asian/African nations is not cited as often. I know many (well-established) professors who don't bother updating their webpage. In fact some of them wouldn't have eve bothered keeping a webpage had it not been for the courses. That said I will take this news with a grain of salt because it is not an easy problem and definitely needs a through review. >Basing opinion on citation index is like saying if this person is not widely cited he is likely to be wrong. No, it does not say that. Perelman wasn't an academic nobody. He was a Miller fellow at Berkeley, and had visiting positions at the Courant Institute and Stony Brook. When he left the academic system, he had job offers at Princeton and Stanford. TL;DR People who work on geometry knew Perelman pretty well. >Having published for 40 years with only very few citations means that his works were either irrelevant or only found extremely limited circulation. Both makes the claims less trustworthy. while i don't know anything about this guy, beside one in 1976, the Google citation index seems to show only ones in current century. "He contributed in the development of mathematics, for which he was awarded to the prize of the Department of physics-mathematical sciences of AS [Academy of Sciences] of USSR in 1990. He published 200 scientific papers and monographs." Well the Kazakh press (inform.kz) seems to take it as fact that a Kazakh mathematician has solved the problem, so there's that. Very weak assumptions. It's Kazakhstan. You might find it surprising but not the whole world is US-centric. They mainly publish in Russian, he probably have strong connections with russian institutes and unless you can access/check/verify publications in russian, your opinion is quite out of place. Which assumptions were weak? I'm not sure what the comment has to do with the US, but the Russophone world is well aware of the importance of this problem to the effect that one would expect news of any consensus on the validity of this approach to percolate to the Anglophone world almost immediately. My Russian is pretty terrible, but my math is decent enough, and the article spends at least the first 12 pages motivating the problem and defining standard notions that any undergraduate should be familiar with. This is another red flag. I was surprised by the long motivation aswell. OTOH, spending 12% of a paper with the motivation does not sound excessive. That said, I don't understand much, due to not knowing Russian and not in depth knowledge about the topic. Many math-professors from LMSU write and publish in Russian, so US-centric citation indexing may not reflect the true picture. Moreover in that paper, all of his self-cited papers are in russian. Any implications for computational fluid dynamics methods? Remember physics does not work like maths: physic is the art of solving an equation without calculating it. Thus I am intuitively thinking the navier stockes solution cannot be found by a mathematician. I was pretty much expecting an approximation of the solution by a physicist because it requires the kind of free spirit accepting to make hypothesis that normally makes a mathematician have an heart attack. The physical solutions tends to be a subset of the mathematical equations. Physicists tends to discard solutions that would involve the world exploding every time a fluid is flowing (I don't know why). Man, I so would like to see a geometrical interpretation of the maxwell equation as a dual space coupling, so we can use intuition instead of math to solve it. The equivalents of formal axiom of geometry describing formal solutions of canonical "dynamic space" that would be attractors of stable solutions and rules to transform them. Faraday's original approach was the "flow" of the field ( that was later mathematized by Maxwell). It's funny how seeing this paper written in Russian makes me want to learn the language. The Anglosphere is only part of the story! Clay Mathematics Page still lists it as unsolved. I know of dozens of "solutions" that have not been accepted. Do we know if this is just submitted or actually accepted by the scientific community. Does his proof involve Hilbert & Fourier spaces? How about Hilbert-Schmidt superoperators? Fourier would be acceptable if and only if there were only linear solution to the problem. No? My reasoning is the following : NS also describes non linear behaviour (turbulent flows that are sensitive to the initial condition thus that may result in solutions that looks like white noise). Linear algebrae can't be used to solve non linear phenomena and thus if a solution is looking like temporal noise, I guess the fourier of the time serie would also would like a solution with a density of probability that would be constant on all spectrum of frequencies that are compatible with the physics (no energy travel faster then the speed of light, hence, there is an upper limit to the frequency). Am I stupid to expect non linear algebrae involved like Liouville theorem ? Hilbert space  cited on p. 23 (bottom).